Warner Leroy Baxter (March 29, 1889 – May 7, 1951)[note 1] was an American film actor from the 1910s to the 1940s. Baxter became known for his role as The Cisco Kid in the 1928 film In Old Arizona, for which he won the Academy Award for Best Actor at the 2nd Academy Awards. He frequently played womanizing, charismatic Latin bandit types in westerns, and played The Cisco Kid or a similar character throughout the 1930s, but had a range of other roles throughout his career. Baxter began his movie career in silent films with his most notable roles being in The Great Gatsby (1926) and The Awful Truth (1925). Baxter's most notable talkies are In Old Arizona (1929), 42nd Street (1932), Slave Ship (1937) with Wallace Beery, Kidnapped (1938) with Freddie Bartholomew, and the 1931 ensemble short film, The Stolen Jools. In the 1940s, he was well known for his recurring role as Dr. Robert Ordway in the Crime Doctor series of ten films. For his contributions to the motion picture industry, Baxter has a star on the Hollywood Walk of Fame. Baxter was born in Columbus, Ohio to Edwin F. Baxter (1867–1889) and Jane Barrett (1869–1962). Baxter was 5 months old when his father died. Baxter and his mother went to live with her brother in Columbus, Ohio. They later moved to New York City, where he became active in dramatics, both participating in school productions and attending plays. In 1898, the two moved to San Francisco where he graduated from Polytechnic High School. When the 1906 San Francisco earthquake struck, Baxter and his mother lived in Golden Gate Park for eight days and then went to live with friends in Alameda for three months. In 1908, they returned to Columbus. After selling farm implements for a living, Baxter worked for four months as the partner of Dorothy Shoemaker in an act on the Keith Vaudeville Circuit. Baxter began his film career as an extra in 1914 in a stock company. He had his first starring role in Sheltered Daughters (1921), and starred in 48 features during the 1920s. His most notable silent roles were in The Great Gatsby (1926), Aloma of the South Seas (1926) as an island love interest opposite dancer Gilda Gray, and an alcoholic doctor in West of Zanzibar (1928) with Lon Chaney. Baxter's most notable starring role was as the Cisco Kid in In Old Arizona (1929), the first all-talking western, for which he won the second Academy Award for Best Actor. He also starred in 42nd Street (1933), Grand Canary (1934), Broadway Bill (1934) and Kidnapped (1938). By 1936, Baxter was the highest-paid actor in Hollywood, but by 1943 he had slipped to B movie roles, and he starred in a series of "Crime Doctor" films for Columbia Pictures. Baxter had roles in more than 100 films between 1914 and 1950. Baxter married Viola Caldwell in 1911, but they were soon separated and then divorced in 1913. He married actress Winifred Bryson in 1918, remaining married until his death in 1951. He was a close friend of William Powell with whom he had starred in three films, and was at Powell's side when Jean Harlow died in 1937. Baxter suffered from arthritis for several years, and in 1951 he underwent a lobotomy as a last resort to ease the chronic pain. On May 7, 1951, he died of pneumonia at age 62 and was interred in Forest Lawn Memorial Park Cemetery in Glendale, California. In 1960, Baxter posthumously received a motion pictures star on the Hollywood Walk of Fame at 6284 Hollywood Boulevard. 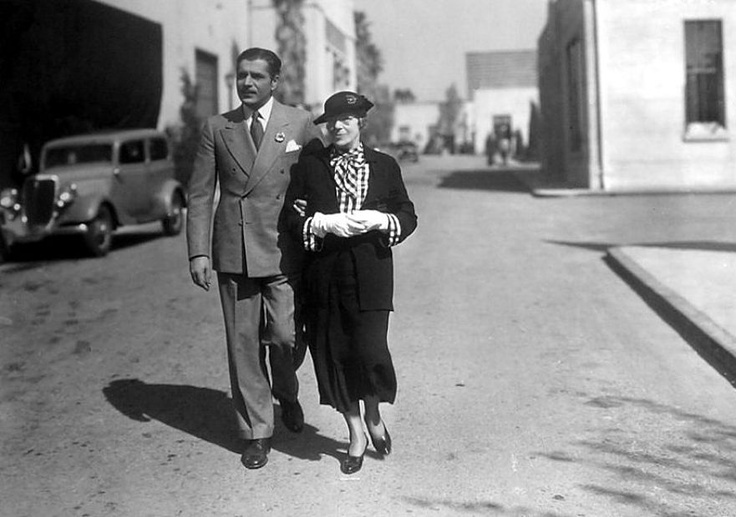 ^ "Los Angeles Times Hollywood Star Walk - Warner Baxter". Los Angeles Times. May 8, 1951. Retrieved May 4, 2017. ^ a b c Ellenberger, Allan R. (2001). Celebrities in Los Angeles Cemeteries: A Directory. McFarland. p. 35. ISBN 9780786450190. Retrieved 11 February 2017. ^ a b Tibbetts, John C.; Welsh, James M. (2010). American Classic Screen Profiles. Scarecrow Press. pp. 26–29. ISBN 9780810876774. Retrieved 11 February 2017. ^ "The Official Academy Awards Database". oscars.org. The Academy of Motion Picture Arts and Sciences. Retrieved May 4, 2017. ^ a b "Hollywood Walk of Fame - Warner Baxter". Hollywood Chamber of Commerce. 8 February 1960. Archived from the original on 2016-04-03. Retrieved 2016-10-06. ^ a b c Cliff Aliperti (29 March 2010). "Warner Baxter-A Brief Biography". Things and Other Stuff. Retrieved 2011-11-16. ^ "Warner Baxter, 62, Star Of Motion Pictures, Dies". The Morning Herald. Maryland, Hagerstown. Associated Press. May 8, 1951. p. 1. Retrieved February 11, 2017 – via Newspapers.com. ^ "Warner Baxter, 59, Film Star, Is Dead: Winner of 'Oscar' in 1929– Best Known for Cisco Kid and 'Crime Doctor' Portrayals". The New York Times. psychosurgery.org. 8 May 1951. Archived from the original on 13 December 2011. Retrieved 2011-11-16. ^ "Warner Baxter, an Academy Award winning actor, sought out a lobotomy against doctors' advice". The Vintage News. 25 December 2017. Wikimedia Commons has media related to Warner Baxter.